TUCSON, AZ (Tucson News Now) - There's a new push across southern Arizona that focuses on heart health for Hispanic women. For the first time, the American Heart Association in Tucson is hosting special classes called Por Tu Corazon. While heart disease can affect anyone, it's the leading cause of death for Latinas. In fact, statistics show they are at a higher risk than other groups. "They are 30 percent more at risk," said Shaima Namazifard, Business Relationship Manager, Go Red for Women. 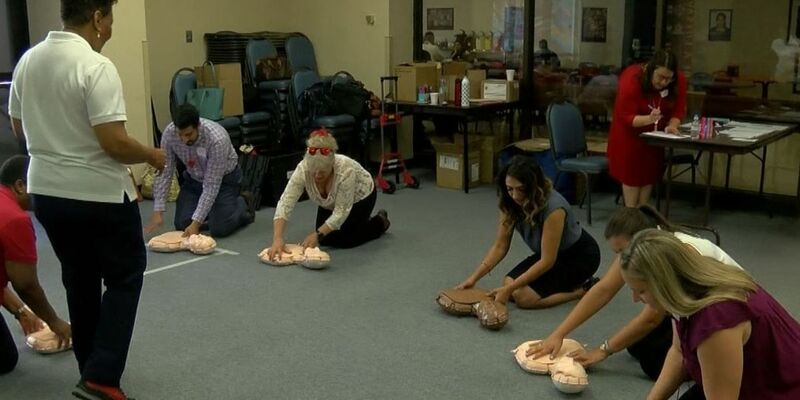 That's why the American Heart Association in Tucson is holding classes like the one they just held at Banner University Medical Center's South Campus. They give Hispanic women the power to take control of their heart health. "I think they're really receptive to the fact that we're playing closer attention to this particular market," Namazifard said. They learn how to perform hands-only CPR, how to use an automated external defibrillator or AED, and how to know their numbers when it comes to total cholesterol, good cholesterol, blood pressure, blood sugar, as well as body mass index. Even if you think you are completely healthy it's best to be prepared. "It can happen at any moment. There are sometimes not too many indicators," Namazifard said. It's also important to know what to do for children in trouble. "A child does not tell you, doesn't respond like an adult," said Jorge Molina, PA, pediatric perfusionist, Banner UMC. "And when you see something that's abnormal you as a parent or as a family member have to react. And if need be, (if) they stop breathing, there are ways through CPR courses the American Heart does teach you." The American Heart Association says knowledge is power and they hope these women take what they've learned to heart. "They can take these skills and really be able to save their lives," Namazifard said.